남해충렬사는 임진왜란이 끝나던 해 노량해전에서 순국한 충무공 이순신의 충의와 넋을 기리기 위해 세워진 사당으로 노량충렬사라고도 한다. 통영의 충렬사와 함께 ‘충열’이란 현판을 처음부터 같이 사용해 왔으며 인조 때 지어졌다. 충무공이 전사한 후 그의 시신이 한 때 이곳에 모셔졌는데 인조 10년(1632) 유림들이 옛 터에 작은 집을 짓고 제사를 지냈던 것이 최초의 사당이다. 충무공이 순국한지 60년이 되던 효종 9년(1658)에 좁고 초라한 옛집을 헐고 새집을 지었다. 그 후 현종 4년(1663)에 통영 충렬사와 함께 임금이 내려준 현판을 받게 되었다. 이런 사실들을 기록한 충무이공묘비가 사당 곁에 있으며, 비문은 현종 2년(1661)에 송시열이 썼고, 1663년에 박경지 등이 세운 것이다. 옛날에는 이 사당 곁에 호충암이란 암자가 있었는데, 화방사의 승려 10명과 승장 1명이 번갈아 와서 사당을 지켰다고 한다. 또한 공이 죽은 후 자운이란 승려가 공을 사모하여 쌀 수백섬을 싣고 와서 공을 위해서 제사를 지낸 것으로도 유명한데 자운은 원래 충무공의 밑에 있던 승병이었다. 충렬사는 충무공의 노량 앞바다를 지키고 있는 수호신의 사당이라 할 수 있다. 경내에는 비각·내삼문·외삼문·관리사 등이 있고 사당 뒤의 정원에는 충무공의 시신을 임시 묻었던 자리에 묘가 남아 있으며, 1948년 정인보가 쓴 충열사비가 있다. Chungnyeolsa in Namhae is an ancestral shrine built to honor the loyalty and spirit of Admiral Yi Sun-sin who died for this country in the naval battle at Noryang in the last year of the Japanese Invasion in 1592. 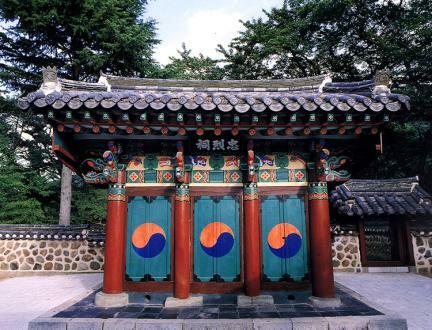 It used the same tablet reading "Chungnyeol" as the Chungnyeolsa of Tongyeong had from the beginning, and was built in 1632, in the reign of King Injo of the Joseon Dynasty. The admiral's body was honored here temporarily after he died in the battle, but Confucian scholars who had admired him built a small house at the same site to honor him, and performed the first ancestral sacrifice. This small old house was rebuilt in a restored shape in 1658, the 9th year of the reign of King Hyojong of Joseon, 60 years after Admiral Yi had passed away. 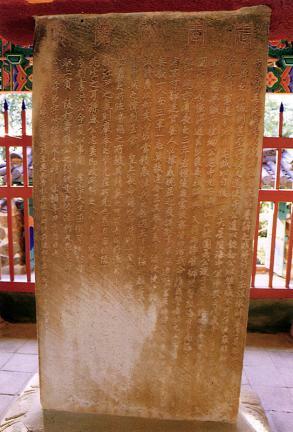 Later, in the 4th year of King Hyeonjong’s reign (1663), the shrine had the honor of being presented with a tablet granted by the king. 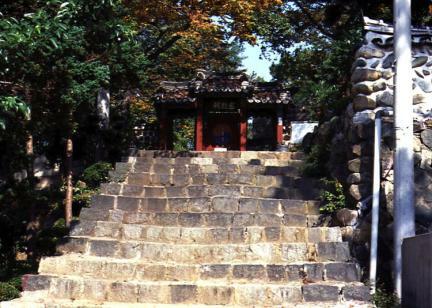 Yi Sun-sin’s tombstone, which was built by the party of Park Gyeong-ji in 1663 and describes these facts, stands just beside the shrine. Song Si-yeol, one of the greatest Confucian scholars, composed the monumental inscription in the 2nd year of King Hyeonjong’s reign (1661). In earlier days there was a small temple named Hochungam Hermitage next to the shrine, and it was guarded in turn by 10 Buddhist priests and another 10 Buddhist officers from Hwabangsa Temple. Another well known story tells that a Buddhist monk named Jaun who had admired the late admiral and fought as a Buddhist soldier under his command brought several hundred bags of rice to perform a memorial sacrifice. 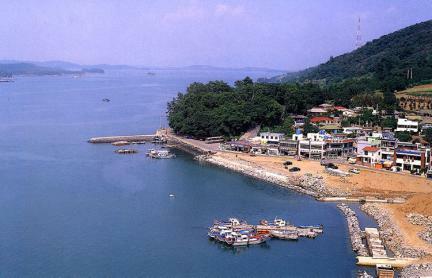 It must be said that Chungnyeolsa is the shrine of the protector god, Yi Sun-sin, Lord Chungmu, who guards the sea at Noryang. 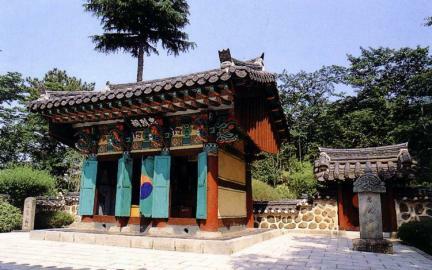 In the compound there are a pavilion, Naesammun and Oesammun Gates, and an office. The admiral’s tomb remains at the same site where he was first buried in the back garden of the temple together with the monument of Chungnyeolsa, the inscription of which was written in 1948 by Jeong In-bo, another greatest Confucian scholar.